Eurocontrol Technics Group Inc. (TSX VENTURE:EUO) ("Eurocontrol" or the "Company"), a Canadian public company specializing in the acquisition, development and commercialization of innovative energy security, authentication, verification and certification technologies, is pleased to announce that its wholly-owned subsidiary, Xenemetrix Ltd. ("Xenemetrix"), has been awarded Frost & Sullivan's 2015 Global Analytical X-ray Instrumentation Price Performance Value Leadership Award. 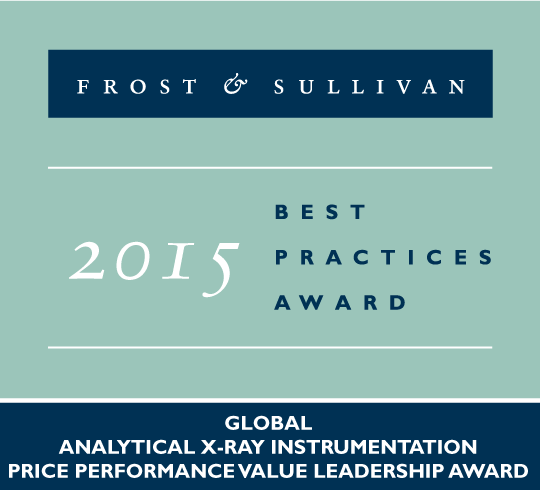 According to Frost & Sullivan, Xenemetrix is among the top Energy Dispersive X-ray fluorescence (EDXRF) companies in the world, dominating the global analytical X-ray instrumentation market with its leadership role. They indicate that Xenemetrix has developed a range of X-ray instruments that provide a smart solution for the needs of diverse industries and that Xenemetrix's systems offer superb functionality at lower prices than those of competing solutions. The Frost & Sullivan report, available on the Company's website, highlights Xenemetrix's high-quality EDXRF mobile systems are extensively used in a wide range of industrial applications and that since its inception in 2008, Xenemetrix has consistently focused on maintaining to deliver the industry's best-in-class, user-friendly EDXRF systems, along with guaranteeing equally commendable customer service to its broad-based global customers. The report also commends Xenemetrix for its expansion of distribution channels across five major market segments including: Asia-Pacific, Europe, the United States, and Latin America and Africa. They indicate that it is Xenemetrix's ability to deliver state-of-the-art analytical solutions with specific attention to its geographically diverse customer base that has provided Xenemetrix with international exposure and a leading edge over its competition. Doron Reinis, Chief Executive Officer of Xenemetrix stated: "Xenemetrix will continue its efforts to bring new innovative products to the market and we will soon introduce a new line of low cost high performance ED-XRF systems." Bruce Rowlands, Chairman and Chief Executive Officer of Eurocontrol added: "We are very pleased to have won a second Frost & Sullivan Award following up on our previous win in 2010. The acknowledgement by Frost & Sullivan of our products and service is important recognition of our focus on high quality products and excellence in customer service." Frost & Sullivan's "Growth Partnership" supports clients by addressing these opportunities and incorporating two key elements driving visionary innovation: The Integrated Value Proposition and The Partnership Infrastructure. The Integrated Value Proposition provides support to our clients throughout all phases of their journey to visionary innovation including: research, analysis, strategy, vision, innovation and implementation. The Partnership Infrastructure is entirely unique as it constructs the foundation upon which visionary innovation becomes possible. This includes Frost & Sullivan's 360 degree research, comprehensive industry coverage, career best practices as well as its global footprint of more than 40 offices. For more than 50 years, Frost & Sullivan has been developing growth strategies for the global 1000, emerging businesses, the public sector and the investment community.